The SA1000 Automatic Pallet Label Applicator is designed to print and apply labels to the side of a pallet load. 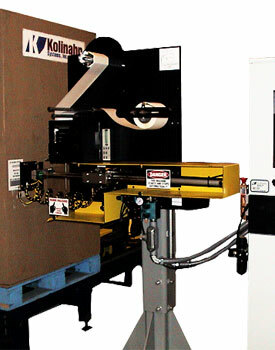 The machine is controlled by a PLC, which can communicate with the conveyor, stretch wrapper, and palletizer to ensure proper product handling during the labeling sequence. Optional full diagnostic reports and communication tracking make troubleshooting easy. A PC program simplifies the process of managing the label format and database. Barcode labels are printed using a Zebra® PAX print engine and are applied to the pallet load by a 24-in (61 cm) variable stroke slide-cylinder tamp assembly. The spring-loaded tamp-pad adapts to the pallet load surface. The rugged PHD® slide-cylinder, heavy-duty stand, UL listed NEMA 12 industrial controls enclosure, and other high quality commercial parts help ensure that the SA100 will handle the rigors of 24/7 pallet load labeling.